The newest podcast is now available for download. On it Kristan, Rob and myself talk (a lot) about the ludicrous decision not to broadcast any FA Cup third round games on Saturday, as well as celebrating the efforts of the five remaining non league clubs. And Finally – Worst Kit Clash Ever? To listen to the podcast or download the mp3, visit the show’s website, where you can also find all the previous episodes. Alternatively, you can get the show via iTunes. Don’t forget to get in touch. Don’t be shy! Comments, criticisms and suggestions are all welcomed and encouraged. Just fill in the form on the Contact Us section of the site, or email me: undertheleague@gmail.com. If you would like to join us on the show, or there is somebody you would like us to try and get on for a chat, let us know via the methods above. And please, tell your friends about us if they have even a passing interest in our beautiful non league game, and consider subscribing to and reviewing us on iTunes. Just two Conference Premier clubs remain in this season’s FA Cup as we enter the fourth round stage, and by the time the ties get played, even they might not be left in the tournament. Both Kidderminster Harriers and Macclesfield Town got excellent home draws to take their third round ties to replays, but in truth the draw for the fourth round hasn’t exactly given them reason to dream. In fairness to Kiddie, a potential trip to Sunderland’s Stadium of Light awaits should they be able to see off Peterborough at London Road after a goalless draw at Aggborough. While it is always better for the smaller side to get drawn away at a bigger club due to the 50-50 split in gate receipts, I’m sure Wearside probably wasn’t too high on the Harriers’ list of dream destinations. Can Macc repeat Steve King’s feat last season and reach the fourth round? Meanwhile, Macclesfield have a potentially winnable game if they can somehow find a way past Sheffield Wednesday at Hillsborough in their third round replay. Steve Williams’ well taken goal late on in the first match rescued a 1-1 draw for the cash strapped Silkmen. Manager John Askey even admitted to not going all out for the win towards the end of the game, stating that the club were desperate for the potential earnings from a replay. Assistant manager Efe Sodje has since said that the money generated will only keep the club going for the next couple of months. 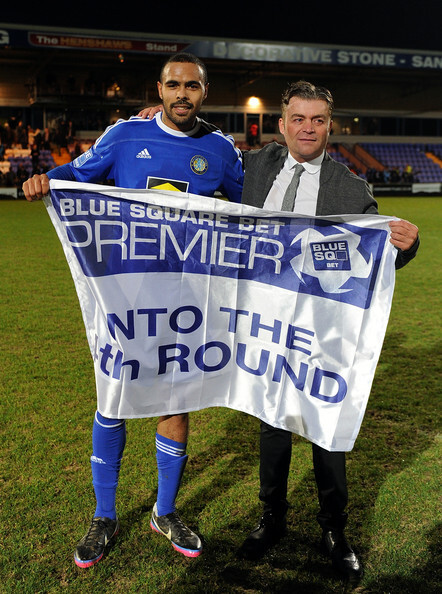 A trip to Rochdale in the fourth round would seem to vindicate the manager’s decision. A winnable tie? Absolutely, but would have been near the bottom of their wishlist in terms of paydays. Here’s hoping that one or both of our nonleague sides can get through not only their replays, but also the fourth round too. It would be a shame for our presence in the cup to end with a whimper. West Midlands Non-League in the FA Cup: Do the three remaining non-league sides stand a chance? With Stourbridge, Tamworth and Kidderminster all still standing in the FA cup, all three sides face possible league opposition, so do they all have a chance of a possible giant killing? Tamworth – Tamworth reach the second round for the third consecutive year as they beat League 2’s Cheltenham Town at the Lamb Ground. Tamworth scored the only goal of the game 20 minutes into the second half as Nick Chadwick scored the goal to put them into the hat for the second round. The Lambs got themselves another tie at home, this time against League One’s basement side Bristol City and with the strength and sheer power of Jay Emmanuel-Thomas up front for the Robins, this will be an incredibly tough affair for the Lambs, but anything is possible in the FA Cup. So with the ties being announced, all three sides have tough opposition, and Stourbridge and Tamworth have a challenge with two of League One’s relegation flirters, while Kidderminster have, looking at the statistics, the easier tie out of the three, even though that cant really be said in a competitions with as many shocks as this.